I can’t imagine going for a morning run without drinking a mug of coffee first. That doesn’t have to do with athletic performance; I just can’t imagine doing anything without coffee first. But there may be wisdom in a pre-workout coffee, as a new umbrella review of more than 300 studies concluded that yes, caffeine does boost athletic performance by 2 to 16 percent. Researchers analyzed 21 meta-analyses that combined studies on more than 4,800 participants, then published their findings in the British Journal Of Sports Medicine. 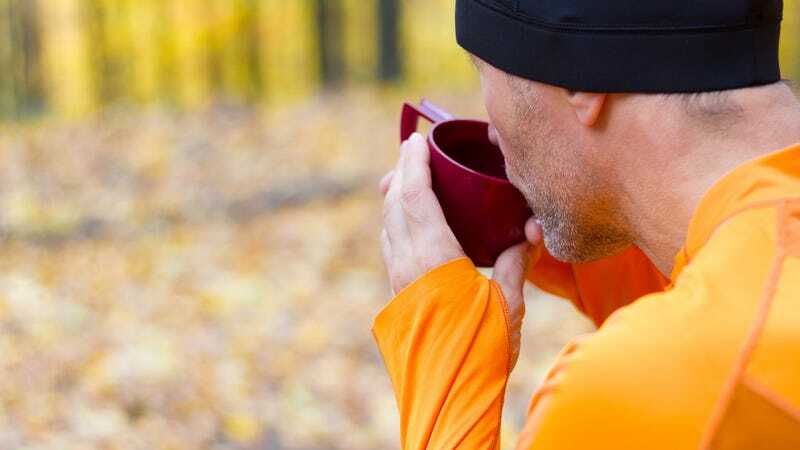 The authors summarize their work in an article for The Conversation, stating caffeine consumption does lead to sports-performance improvements. On the high end, some people could see improvements up to 16%, but the average person’s athletic performance would only increase 2 to 6 percent. Still, the authors note that even a performance uptick of 2% could be the difference between winning or losing a competition. Caffeine is thought to improve both endurance (number of miles run or cycled) and discreet performance (weight lifted) because of the way it binds to certain receptors in our brains. Receptors that would normally bind to adenosine and signal to our bodies that we’re fatigued instead are blocked by caffeine. It thus reduces feelings of exhaustion and encourages the body to exert more effort. To apply these findings to your own athletic pursuits, the researchers note the average dosage to achieve these results would be about 210 to 420 milligrams of caffeine for a 150-pound person, or about two cups of coffee, consumed roughly 45 to 90 minutes before a workout. People who are not used to drinking caffeine should begin at a lower dose, just to be safe. And of course, if caffeine gives you an upset stomach or headache, then it’s likely to be more of a detriment than a boon to your race time. So, what else can properly timed caffeine consumption do? Improve accuracy on tasks requiring concentration, for one. It can also help you nap better. Seriously.